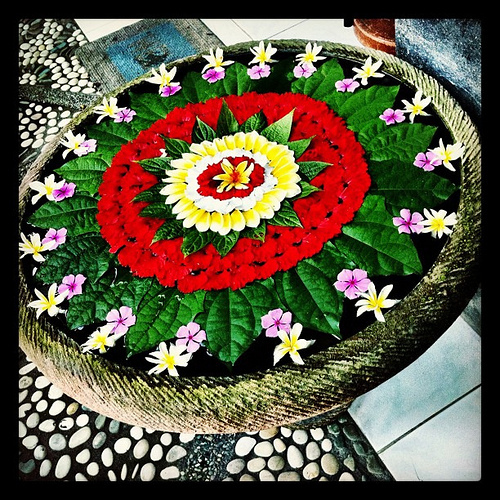 It doesn’t take long, in Bali, to come across a ‘canang sari‘ or offering basket. They are everywhere. It is said that these offerings are a way of giving back what has been given…a recognition that what we have is gift, and that the appropriate response is, in return, gift. Of course it was time consuming, now that he pointed it out. But even more beautiful because of it’s complete lack of usefulness, other than to provide beauty, no? 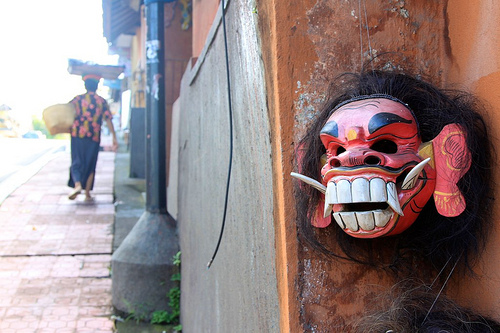 This image is simply from a walk down the street in Ubud (Bali). I noticed the mask and then saw the woman carrying her burden in the distance. The timing of it was lucky–and sufficient to frame this shot, which is clearly ‘focused’ on the foreground, but which invites a longer look. 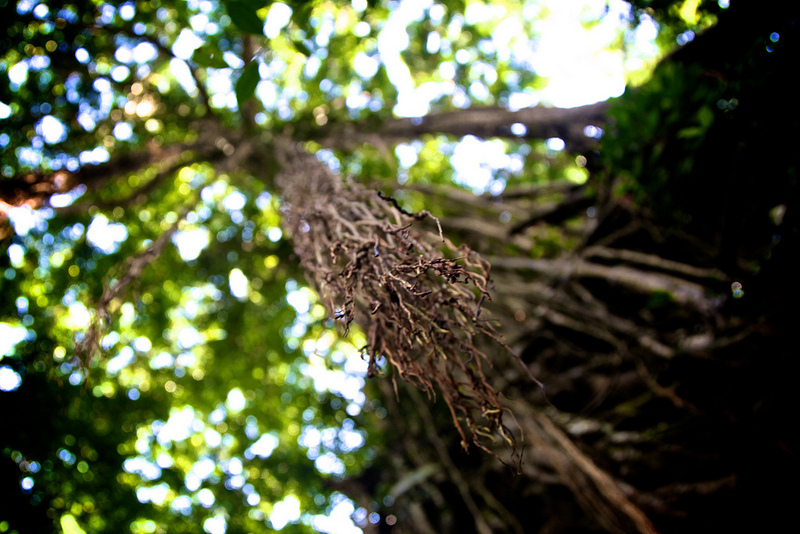 Roots are often thought of as that which is underground, buried, or the otherwise invisible part of something that is growing–which is perhaps why it was so startling to walk through the sacred monkey forest in Ubud (Bali) and look up to see this image. The light was softly filtered, coming down through the canopy of trees–both soaring heavenward and plunging toward the earth. Hanging tree roots, sacred Monkey Forest, Ubud, Bali (Indonesia). This image is from Bali. 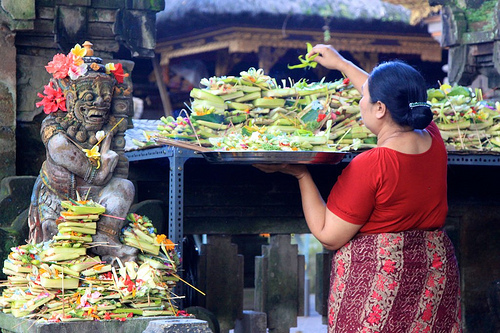 We were in Ubud, and could not enter the temple area in the monkey forest because the women were preparing for a ceremony and festival to welcome the new moon. 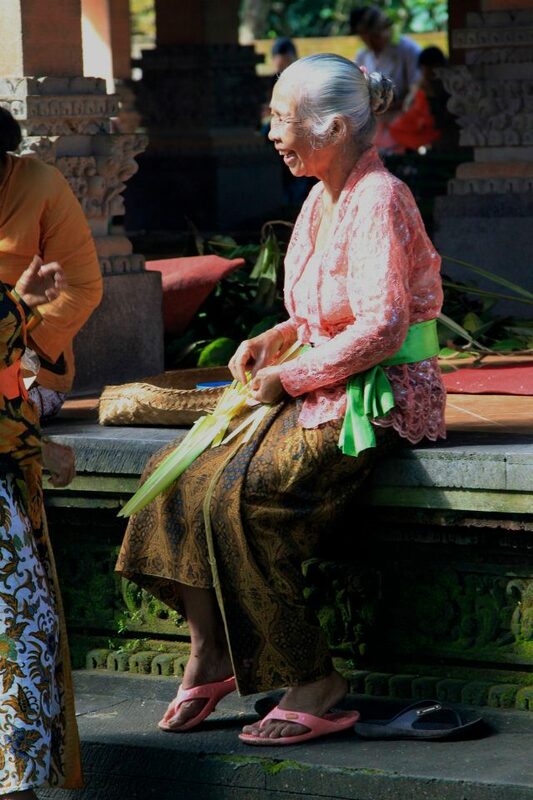 As I stood outside the wrought iron gate and watched the women prepare the woven offerings, I was drawn in by this woman. She had a presence about her that intrigued me. As I watched, she began to speak with one of the other woman and in so doing broke into this beautiful smile. So, here I sit, in a Starbucks in Bali. I do feel the need to explain the ‘Starbucks’ part of that first–I have to wait three hours for someone to arrive. It is hot outside. I stick out here. There are many taxis wanting to take tourists places. There is free wifi in starbucks. 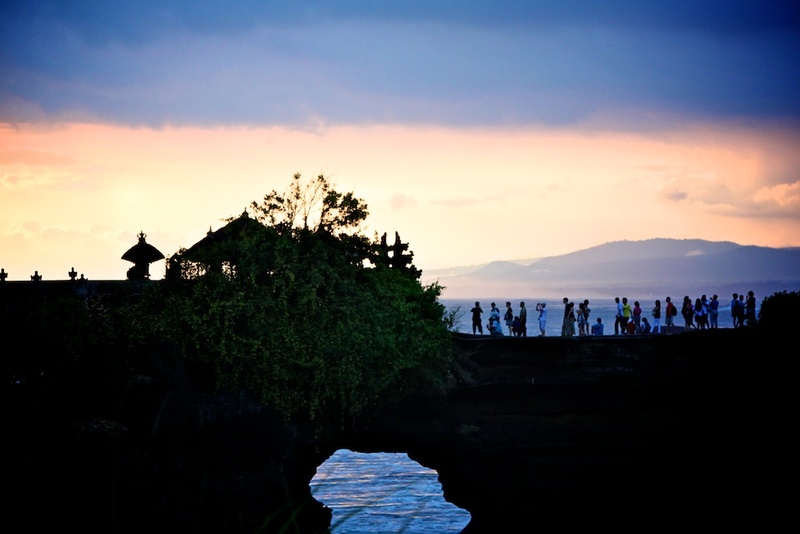 But the Bali part is, of course, the more interesting of the two locations. It’s origin actually starts, or, can be at least linked to, an In N Out Burger in Costa Mesa, California. It was there, on 19th Street, back in 2004 I believe, that I remember, distinctly, having a cell phone conversation with my friend Kim, while I was sitting in the parking lot of In N Out. We were discussing what I would do with my life. At that point, in 2004, I both had no idea how long that would take to play out, or how crazy and amazingly that ‘playing out’ would actually go. “I think what I’d love to do, or at least part of what I’d love to do, is to travel the world, visiting with ‘missionaries’ (it is not a word I like, as to me it sounds like catholic priests forcing indians to convert as the Spanish colonized the Americas, or the family from the Poisonwood Bible going to ‘save’ the ‘heathens’ of Africa–as if God were not already in Africa, and as if they could possibly ‘bring’ God with them…? But, then again, I’m ordained as a evangelist, which is also a word that has gotten a pretty bad rap, but which, perhaps like missionary, could use some ‘redeeming’ as a word too. But, since I don’t have another word to use in its place, ‘missionaries’ will have to do for now.) to both encourage them, but to also help tell their stories back to the rest of the world ‘at home’ so that their stories can be heard.” That’s what I said to Kim that afternoon from the parking lot. And that, eight years later, is what I’m doing in Bali. And Vietnam. Sure, I’ve done quite a bit of this in the intervening years, traveling, storytelling, sharing back through photos and words the people, the food, the experiences of ‘far off’ places. For me, it’s an inherent part of my calling, and why I pushed for the ordination as an ‘evangelist’ and not the more traditional path of minister. An evangelist, I think, in its truest sense, is someone who tells the ‘good news’ of how God (or Spirit, or love…for those of you who can’t bring yourself to use the G word, but who still would like to acknowledge something that is more than my own individual self) is already at work in the world, long before we (whoever the ‘we’ happens to be) get there with our good intentions, desire to help, save, or otherwise impact the locals. As an evangelist who also happens to be a photographer and a writer, I see these pieces as all intertwined. So, what am I doing in Bali? I’m here with the PCUSA, to help tell the stories of those who are working in the region (they will be gathering at a conference/training here). From here we will travel to Vietnam, to meet with various folks there, see their lives, and hear their stories. 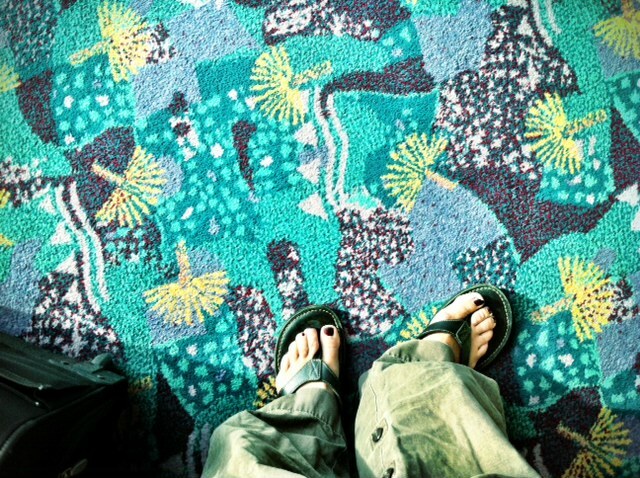 Bali is a long way from Baja. And 2012 is quite a ways from 2004. A lot of life has happened in between. But one piece that has remained constant, that has even increased, is this desire–a desire to help people see, to tell the story, and, in so doing, to cross-pollinate my many worlds in a way that will, I hope, bear fruit.